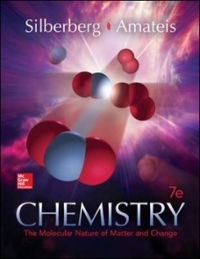 Chemistry: The Molecular Nature of Matter and Change 7 Edition Chemistry: The Molecular Nature of Matter and Change by Martin Silberberg has been recognized in the general chemistry market as an unparalleled classic. The seventh edition keeps pace with the evolution of student learning by adding and significantly enhancing sample problems, a key resource of students. The text still contains unprecedented macroscopic-to-microscopic molecular illustrations, consistent step-by-step worked exercises in every chapter, and an extensive range of end-of-chapter problems, which provide engaging applications covering a wide variety of interests, including engineering, medicine, materials, and environmental studies. Changes have been made to the text and applications throughout to make them more succinct, to the artwork to make it more teachable and modern, and to the design to make it more simplistic and open.